Raz Fresco of The Bakers Club and Devin Miles of The RLES camp linked up in Pittsburgh this summer. Besides working together in the studio the pair also did a meet and greet in the shop. It was a good turn out and fortunately Gilpin Films captured the experience. Check the video below for a recap of the in store and some exlcusive in-studio footage of Raz and Devin. 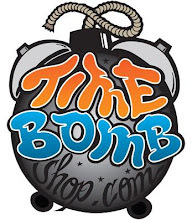 All Timebomb clothing seen in the video is available here!